This dwarf writer support class manages information associated with a source file. Definition at line 40 of file DwarfUnit.h. Definition at line 76 of file DwarfUnit.cpp. Definition at line 89 of file DwarfUnit.cpp. References DD, DIEBlocks, DIELocs, llvm::DwarfDebug::getDwarfVersion(), and getLanguage(). Definition at line 383 of file DwarfUnit.cpp. References llvm::DIEValueList::addValue(), Asm, llvm::DIELoc::BestForm(), llvm::DIELoc::ComputeSize(), DD, DIELocs, DIEValueAllocator, and llvm::DwarfDebug::getDwarfVersion(). Referenced by llvm::DwarfCompileUnit::addAddress(), llvm::DwarfCompileUnit::addComplexAddress(), addConstantValue(), llvm::DwarfCompileUnit::addLocationAttribute(), applySubprogramAttributes(), constructContainingTypeDIEs(), llvm::DwarfCompileUnit::constructLabelDIE(), constructTypeDIE(), getDIELoc(), and llvm::DwarfCompileUnit::updateSubprogramScopeDIE(). Definition at line 390 of file DwarfUnit.cpp. References llvm::DIEValueList::addValue(), Asm, llvm::DIEBlock::BestForm(), llvm::DIEBlock::ComputeSize(), DIEBlocks, and DIEValueAllocator. Start with the address based on the location provided, and generate the DWARF information necessary to find the actual Block variable (navigating the Block struct) based on the starting location. Add the DWARF information to the die. Obsolete, please use addComplexAddress instead. Add constant value entry in variable DIE. Definition at line 492 of file DwarfUnit.cpp. References Asm, assert(), llvm::APFloat::bitcastToAPInt(), DIEValueAllocator, llvm::APInt::getBitWidth(), llvm::AsmPrinter::getDataLayout(), llvm::MachineOperand::getFPImm(), llvm::APInt::getRawData(), llvm::ConstantFP::getValueAPF(), llvm::MachineOperand::isFPImm(), and llvm::DataLayout::isLittleEndian(). Referenced by llvm::DwarfCompileUnit::constructLabelDIE(), getDIELoc(), and getOrCreateStaticMemberDIE(). Definition at line 514 of file DwarfUnit.cpp. References addConstantValue(), llvm::APFloat::bitcastToAPInt(), and llvm::ConstantFP::getValueAPF(). Definition at line 524 of file DwarfUnit.cpp. References assert(), DD, llvm::MachineOperand::getImm(), llvm::MachineOperand::isImm(), and isUnsignedDIType(). Referenced by addConstantFPValue(), addConstantValue(), llvm::DwarfCompileUnit::addLocationAttribute(), llvm::DwarfCompileUnit::constructLabelDIE(), constructTypeDIE(), getDIELoc(), getOrCreateStaticMemberDIE(), and hasVectorBeenPadded(). Definition at line 519 of file DwarfUnit.cpp. Definition at line 538 of file DwarfUnit.cpp. References addConstantValue(), DD, and isUnsignedDIType(). Definition at line 542 of file DwarfUnit.cpp. References addBlock(), addConstantValue(), addUInt(), Asm, DIEValueAllocator, llvm::APInt::getBitWidth(), llvm::AsmPrinter::getDataLayout(), llvm::APInt::getRawData(), llvm::APInt::getSExtValue(), llvm::APInt::getZExtValue(), and llvm::DataLayout::isLittleEndian(). Definition at line 531 of file DwarfUnit.cpp. Add a DIE attribute data and value. Definition at line 347 of file DwarfUnit.cpp. Referenced by addType(), applySubprogramAttributes(), applySubprogramDefinitionAttributes(), llvm::DwarfCompileUnit::constructAbstractSubprogramScopeDIE(), llvm::DwarfCompileUnit::constructCallSiteEntryDIE(), constructContainingTypeDIEs(), llvm::DwarfCompileUnit::constructImportedEntityDIE(), llvm::DwarfCompileUnit::constructInlinedScopeDIE(), llvm::DwarfCompileUnit::constructSubprogramScopeDIE(), constructTypeDIE(), llvm::DwarfCompileUnit::finishEntityDefinition(), llvm::DwarfCompileUnit::finishSubprogramDefinition(), getDIELoc(), llvm::DwarfCompileUnit::getOrCreateGlobalVariableDIE(), and getParentContextString(). Definition at line 362 of file DwarfUnit.cpp. References llvm::DIEValueList::addValue(), DIEValueAllocator, llvm::DIEEntry::getEntry(), llvm::DIE::getUnit(), and llvm::DIEUnit::getUnitDie(). Add a type's DW_AT_signature and set the declaration flag. Definition at line 351 of file DwarfUnit.cpp. References addFlag(), llvm::DIEValueList::addValue(), and DIEValueAllocator. Referenced by llvm::DwarfDebug::addDwarfTypeUnitType(), and getDIELoc(). Add a flag that is true to the DIE. Definition at line 204 of file DwarfUnit.cpp. References llvm::DIEValueList::addValue(), DD, DIEValueAllocator, and llvm::DwarfDebug::getDwarfVersion(). Referenced by addDIETypeSignature(), applySubprogramAttributes(), llvm::DwarfCompileUnit::applyVariableAttributes(), llvm::DwarfCompileUnit::constructCallSiteEntryDIE(), constructContainingTypeDIEs(), constructSubprogramArguments(), constructTypeDIE(), getDIELoc(), llvm::DwarfCompileUnit::getOrCreateGlobalVariableDIE(), getOrCreateNameSpace(), getOrCreateStaticMemberDIE(), hasVectorBeenPadded(), llvm::DwarfDebug::shareAcrossDWOCUs(), and llvm::DwarfCompileUnit::updateSubprogramScopeDIE(). Add a new global name to the compile unit. 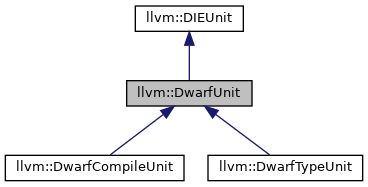 Implemented in llvm::DwarfTypeUnit, and llvm::DwarfCompileUnit. Referenced by llvm::DwarfTypeUnit::getHeaderSize(), and hasContent(). Add a new global type to the compile unit. Add a Dwarf label attribute data and value. Definition at line 273 of file DwarfUnit.cpp. Referenced by addLabel(), addOpAddress(), addSectionLabel(), and getDIELoc(). Definition at line 280 of file DwarfUnit.cpp. Add a label delta attribute data and value. Definition at line 341 of file DwarfUnit.cpp. Add a linkage name, if it isn't empty. Definition at line 571 of file DwarfUnit.cpp. References addString(), DD, llvm::GlobalValue::dropLLVMManglingEscape(), llvm::StringRef::empty(), and llvm::DwarfDebug::getDwarfVersion(). Referenced by llvm::DwarfCompileUnit::addLocationAttribute(), applySubprogramDefinitionAttributes(), and getDIELoc(). Add the DW_AT_loclists_base attribute to the unit DIE. Definition at line 1684 of file DwarfUnit.cpp. References addSectionLabel(), Asm, assert(), DD, DU, llvm::DwarfDebug::getDwarfVersion(), llvm::DwarfFile::getLoclistsTableBaseSym(), llvm::AsmPrinter::getObjFileLowering(), and llvm::DIEUnit::getUnitDie(). Add a dwarf op address data and value using the form given and an op of either DW_FORM_addr or DW_FORM_GNU_addr_index. Definition at line 323 of file DwarfUnit.cpp. References addLabel(), addUInt(), DD, llvm::DwarfDebug::getAddressPool(), llvm::DwarfDebug::getDwarfVersion(), llvm::AddressPool::getIndex(), and llvm::DwarfDebug::useSplitDwarf(). Referenced by llvm::DwarfCompileUnit::addLocationAttribute(), llvm::DwarfCompileUnit::constructLabelDIE(), constructTypeDIE(), and getDIELoc(). Add the DW_AT_rnglists_base attribute to the unit DIE. Definition at line 1675 of file DwarfUnit.cpp. References addSectionLabel(), Asm, assert(), DD, DU, llvm::DwarfDebug::getDwarfVersion(), llvm::AsmPrinter::getObjFileLowering(), llvm::DwarfFile::getRnglistsTableBaseSym(), and llvm::DIEUnit::getUnitDie(). addSectionDelta - Add a label delta attribute data and value. Definition at line 1625 of file DwarfUnit.cpp. Referenced by llvm::DwarfCompileUnit::addScopeRangeList(), addSectionLabel(), and getHeaderSize(). Add a Dwarf section label attribute data and value. Definition at line 1634 of file DwarfUnit.cpp. References addLabel(), addSectionDelta(), Asm, DD, llvm::MCAsmInfo::doesDwarfUseRelocationsAcrossSections(), llvm::DwarfDebug::getDwarfVersion(), llvm::AsmPrinter::MAI, and llvm::DwarfDebug::useSplitDwarf(). Referenced by llvm::DwarfCompileUnit::addAddrTableBase(), addLoclistsBase(), addRnglistsBase(), llvm::DwarfCompileUnit::addScopeRangeList(), addStringOffsetsStart(), getHeaderSize(), and llvm::DwarfCompileUnit::initStmtList(). Add an offset into a section attribute data and value. Definition at line 284 of file DwarfUnit.cpp. References addUInt(), DD, and llvm::DwarfDebug::getDwarfVersion(). Referenced by getDIELoc(), and getMD5AsBytes(). Add an signed integer attribute data and value. Definition at line 227 of file DwarfUnit.cpp. References llvm::DIEValueList::addValue(), llvm::DIEInteger::BestForm(), and DIEValueAllocator. Referenced by addSInt(), constructTypeDIE(), and getDIELoc(). Definition at line 234 of file DwarfUnit.cpp. Add location information to specified debug information entry. Definition at line 397 of file DwarfUnit.cpp. Referenced by addSourceLine(), llvm::DwarfCompileUnit::applyLabelAttributes(), applySubprogramAttributes(), llvm::DwarfCompileUnit::applyVariableAttributes(), constructContainingTypeDIEs(), llvm::DwarfCompileUnit::constructImportedEntityDIE(), constructTypeDIE(), getDIELoc(), llvm::DwarfCompileUnit::getOrCreateCommonBlock(), llvm::DwarfCompileUnit::getOrCreateGlobalVariableDIE(), getOrCreateStaticMemberDIE(), and getParentContextString(). Definition at line 406 of file DwarfUnit.cpp. References addSourceLine(), assert(), llvm::DIVariable::getFile(), and llvm::DIVariable::getLine(). Definition at line 412 of file DwarfUnit.cpp. Definition at line 418 of file DwarfUnit.cpp. References addSourceLine(), assert(), and llvm::DIScope::getFile(). Definition at line 424 of file DwarfUnit.cpp. References addSourceLine(), assert(), llvm::DILabel::getFile(), and llvm::DILabel::getLine(). Definition at line 430 of file DwarfUnit.cpp. References addSourceLine(), assert(), llvm::DIScope::getFile(), and llvm::DIType::getLine(). Definition at line 436 of file DwarfUnit.cpp. References addSourceLine(), assert(), llvm::DIObjCProperty::getFile(), and llvm::DIObjCProperty::getLine(). Add a string attribute data and value. We always emit a reference to the string pool instead of immediate strings so that DIEs have more predictable sizes. In the case of split dwarf we emit an index into another table which gets us the static offset into the string table. Definition at line 239 of file DwarfUnit.cpp. References llvm::DIEValueList::addValue(), Asm, CUNode, DD, DIEValueAllocator, DU, llvm::DwarfStringPool::getEntry(), llvm::DwarfStringPool::getIndexedEntry(), llvm::DwarfFile::getStringPool(), llvm::DICompileUnit::isDebugDirectivesOnly(), llvm::DwarfDebug::useInlineStrings(), and useSegmentedStringOffsetsTable(). Referenced by addLinkageName(), llvm::DwarfCompileUnit::applyLabelAttributes(), applySubprogramAttributes(), llvm::DwarfCompileUnit::applyVariableAttributes(), llvm::DwarfDebug::beginModule(), constructContainingTypeDIEs(), llvm::DwarfCompileUnit::constructImportedEntityDIE(), constructTypeDIE(), llvm::DwarfCompileUnit::createBaseTypeDIEs(), getDIELoc(), llvm::DwarfCompileUnit::getOrCreateCommonBlock(), llvm::DwarfCompileUnit::getOrCreateGlobalVariableDIE(), getOrCreateModule(), getOrCreateNameSpace(), getOrCreateStaticMemberDIE(), getParentContextString(), hasVectorBeenPadded(), and llvm::DwarfDebug::shareAcrossDWOCUs(). Add the DW_AT_str_offsets_base attribute to the unit DIE. Definition at line 1668 of file DwarfUnit.cpp. References addSectionLabel(), Asm, DU, llvm::MCSection::getBeginSymbol(), llvm::MCObjectFileInfo::getDwarfStrOffSection(), llvm::AsmPrinter::getObjFileLowering(), llvm::DwarfFile::getStringOffsetsStartSym(), and llvm::DIEUnit::getUnitDie(). Referenced by getHeaderSize(), and llvm::DwarfDebug::shareAcrossDWOCUs(). Add template parameters in buffer. Definition at line 579 of file DwarfUnit.cpp. Referenced by applySubprogramDefinitionAttributes(), constructTypeDIE(), getDIELoc(), and llvm::DwarfCompileUnit::getOrCreateGlobalVariableDIE(). Definition at line 590 of file DwarfUnit.cpp. Referenced by applySubprogramAttributes(), and getDIELoc(). Add a new type attribute to the specified entity. This takes and attribute parameter because DW_AT_friend attributes are also type references. Definition at line 698 of file DwarfUnit.cpp. References addDIEEntry(), assert(), and getOrCreateTypeDIE(). Referenced by addThrownTypes(), applySubprogramAttributes(), llvm::DwarfCompileUnit::applyVariableAttributes(), constructContainingTypeDIEs(), constructSubprogramArguments(), constructTypeDIE(), getDIELoc(), llvm::DwarfCompileUnit::getOrCreateGlobalVariableDIE(), getOrCreateStaticMemberDIE(), getParentContextString(), and hasVectorBeenPadded(). Add an unsigned integer attribute data and value. Definition at line 213 of file DwarfUnit.cpp. References llvm::DIEValueList::addValue(), assert(), llvm::DIEInteger::BestForm(), and DIEValueAllocator. Referenced by addConstantValue(), llvm::DwarfCompileUnit::addLocationAttribute(), addOpAddress(), llvm::DwarfCompileUnit::addScopeRangeList(), addSectionOffset(), addSourceLine(), addUInt(), applySubprogramAttributes(), applySubprogramDefinitionAttributes(), llvm::DwarfCompileUnit::applyVariableAttributes(), llvm::DwarfDebug::beginModule(), llvm::DwarfCompileUnit::constructAbstractSubprogramScopeDIE(), constructContainingTypeDIEs(), llvm::DwarfCompileUnit::constructInlinedScopeDIE(), llvm::DwarfCompileUnit::constructLabelDIE(), constructSubprogramArguments(), constructTypeDIE(), llvm::DwarfCompileUnit::createBaseTypeDIEs(), getDIELoc(), llvm::DwarfCompileUnit::getOrCreateGlobalVariableDIE(), getOrCreateStaticMemberDIE(), getParentContextString(), hasVectorBeenPadded(), llvm::DwarfDebug::shareAcrossDWOCUs(), and llvm::DwarfCompileUnit::updateSubprogramScopeDIE(). Definition at line 222 of file DwarfUnit.cpp. Definition at line 1169 of file DwarfUnit.cpp. References llvm::DwarfDebug::addAccelType(), addBlock(), addDIEEntry(), addFlag(), addSourceLine(), addString(), addThrownTypes(), addType(), addUInt(), applySubprogramDefinitionAttributes(), llvm::AMDGPU::HSAMD::Kernel::Key::Args, Asm, constructSubprogramArguments(), ContainingTypeMap, createAndAddDIE(), CUNode, DD, llvm::dwarf::DW_ACCESS_private, llvm::dwarf::DW_ACCESS_protected, llvm::dwarf::DW_ACCESS_public, llvm::StringRef::empty(), llvm::DISubrange::getCount(), llvm::DICompileUnit::getDebugInfoForProfiling(), getDIE(), getDIELoc(), llvm::AsmPrinter::getISAEncoding(), getLanguage(), llvm::DIScope::getName(), llvm::DIEUnit::getUnitDie(), IndexTyDie, llvm::isa(), llvm::AMDGPU::HSAMD::Kernel::Key::Language, Name, llvm::None, resolve(), llvm::DITypeRefArray::size(), and llvm::DwarfDebug::useAppleExtensionAttributes(). Referenced by llvm::DwarfCompileUnit::applySubprogramAttributesToDefinition(), getDIELoc(), and getOrCreateSubprogramDIE(). Definition at line 1126 of file DwarfUnit.cpp. References addDIEEntry(), addLinkageName(), addTemplateParams(), addUInt(), assert(), DD, DU, llvm::StringRef::empty(), llvm::DwarfFile::getAbstractSPDies(), getDIE(), llvm::DIScope::getFile(), llvm::LinkageName, llvm::None, and llvm::DwarfDebug::useAllLinkageNames(). Construct DIEs for types that contain vtables. Definition at line 1401 of file DwarfUnit.cpp. References addBlock(), addDIEEntry(), addFlag(), addSourceLine(), addString(), addType(), addUInt(), llvm::DIEValueList::addValue(), Asm, ContainingTypeMap, createAndAddDIE(), D, DD, DIEValueAllocator, llvm::dwarf::DW_ACCESS_private, llvm::dwarf::DW_ACCESS_protected, llvm::dwarf::DW_ACCESS_public, llvm::DIType::getAlignInBytes(), llvm::DebugHandlerBase::getBaseTypeSize(), llvm::AsmPrinter::getDataLayout(), getDIE(), llvm::DwarfDebug::getDwarfVersion(), llvm::DIType::getName(), llvm::DIType::getOffsetInBits(), llvm::DIType::getSizeInBits(), llvm::DINode::getTag(), llvm::DIType::isArtificial(), llvm::DataLayout::isLittleEndian(), llvm::DIType::isPrivate(), llvm::DIType::isProtected(), llvm::DIType::isPublic(), llvm::DIType::isVirtual(), Name, llvm::None, resolve(), Size, and llvm::DwarfDebug::useDWARF2Bitfields(). Referenced by llvm::DwarfDebug::beginModule(), and getDIELoc(). Definition at line 799 of file DwarfUnit.cpp. References addFlag(), addType(), addUInt(), Arg, assert(), constructTypeDIE(), createAndAddDIE(), llvm::DISubroutineType::getCC(), getLanguage(), llvm::DIType::isArtificial(), llvm::DIType::isLValueReference(), llvm::DIType::isRValueReference(), llvm::AMDGPU::HSAMD::Kernel::Key::Language, N, resolve(), and llvm::DITypeRefArray::size(). Definition at line 847 of file DwarfUnit.cpp. References addBlock(), addConstantValue(), addDIEEntry(), addFlag(), addOpAddress(), addSInt(), addSourceLine(), addString(), addTemplateParams(), addType(), addUInt(), Asm, assert(), createAndAddDIE(), DD, DIEValueAllocator, llvm::StringRef::empty(), llvm::DIType::getAlignInBytes(), llvm::DICompositeType::getDiscriminator(), llvm::DICompositeType::getElements(), llvm::DIType::getName(), llvm::DITemplateParameter::getName(), getOrCreateStaticMemberDIE(), getOrCreateSubprogramDIE(), getOrCreateTypeDIE(), llvm::DICompositeType::getRuntimeLang(), llvm::DIType::getSizeInBits(), llvm::AsmPrinter::getSymbol(), llvm::DINode::getTag(), llvm::DIE::getTag(), llvm::DICompositeType::getTemplateParams(), llvm::DITemplateParameter::getType(), llvm::DITemplateValueParameter::getValue(), llvm::DICompositeType::getVTableHolder(), llvm::DIType::isAppleBlockExtension(), llvm::DIType::isForwardDecl(), llvm::DIType::isObjcClassComplete(), llvm::DIType::isTypePassByReference(), llvm::DIType::isTypePassByValue(), isUnsignedDIType(), Name, llvm::None, resolve(), Size, and llvm::Tag. Referenced by constructSubprogramArguments(), createTypeDIE(), llvm::DwarfTypeUnit::createTypeDIE(), getHeaderSize(), getParentContextString(), and resolve(). Create a DIE with the given Tag, add the DIE to its parent, and call insertDIE if MD is not null. Definition at line 376 of file DwarfUnit.cpp. References llvm::DIE::addChild(), DIEValueAllocator, llvm::DIE::get(), and insertDIE(). Referenced by addThrownTypes(), applySubprogramAttributes(), llvm::DwarfCompileUnit::constructAbstractSubprogramScopeDIE(), llvm::DwarfCompileUnit::constructCallSiteEntryDIE(), constructContainingTypeDIEs(), constructSubprogramArguments(), constructTypeDIE(), createTypeDIE(), llvm::DwarfTypeUnit::createTypeDIE(), getDIELoc(), llvm::DwarfCompileUnit::getOrCreateCommonBlock(), llvm::DwarfCompileUnit::getOrCreateGlobalVariableDIE(), getOrCreateModule(), getOrCreateNameSpace(), getOrCreateStaticMemberDIE(), getOrCreateSubprogramDIE(), and hasVectorBeenPadded(). Creates type DIE with specific context. Definition at line 627 of file DwarfUnit.cpp. References llvm::DwarfDebug::addDwarfTypeUnitType(), constructTypeDIE(), createAndAddDIE(), DD, llvm::DwarfDebug::generateTypeUnits(), llvm::DwarfTypeUnit::getCU(), llvm::DINode::getTag(), llvm::DIType::isForwardDecl(), and updateAcceleratorTables(). Referenced by getDIELoc(), and llvm::DwarfTypeUnit::setType(). Emit the common part of the header for this unit. Definition at line 1571 of file DwarfUnit.cpp. References Asm, llvm::AsmPrinter::createTempSymbol(), DD, llvm::AsmPrinter::emitDwarfSymbolReference(), llvm::AsmPrinter::emitInt16(), llvm::AsmPrinter::emitInt32(), llvm::AsmPrinter::emitInt8(), llvm::AsmPrinter::EmitLabelDifference(), EndLabel, llvm::MCSection::getBeginSymbol(), llvm::MCAsmInfo::getCodePointerSize(), llvm::MCObjectFileInfo::getDwarfAbbrevSection(), llvm::DwarfDebug::getDwarfVersion(), llvm::DwarfTypeUnit::getHeaderSize(), llvm::AsmPrinter::getObjFileLowering(), llvm::DIEUnit::getUnitDie(), llvm::AsmPrinter::MAI, llvm::AsmPrinter::OutStreamer, llvm::cl::Prefix, and llvm::DwarfDebug::useSectionsAsReferences(). Referenced by llvm::DwarfCompileUnit::emitHeader(), llvm::DwarfTypeUnit::emitHeader(), and resolve(). Emit the header for this unit, not including the initial length field. Referenced by llvm::DwarfFile::emitUnit(), getHeaderSize(), and llvm::DwarfTypeUnit::setType(). Definition at line 86 of file DwarfUnit.h. Definition at line 89 of file DwarfUnit.h. Referenced by llvm::DwarfDebug::beginModule(), computeIndexValue(), emitDebugRangesImpl(), emitRangeList(), llvm::DwarfFile::emitUnit(), forBothCUs(), and llvm::DwarfCompileUnit::includeMinimalInlineScopes(). Returns the DIE map slot for the specified debug variable. We delegate the request to DwarfDebug when the MDNode can be part of the type system, since DIEs for the type system can be shared across CUs and the mappings are kept in DwarfDebug. Definition at line 190 of file DwarfUnit.cpp. References DU, llvm::DwarfFile::getDIE(), isShareableAcrossCUs(), and MDNodeToDieMap. Referenced by applySubprogramAttributes(), applySubprogramDefinitionAttributes(), constructContainingTypeDIEs(), llvm::DwarfCompileUnit::constructImportedEntityDIE(), llvm::DwarfTypeUnit::createTypeDIE(), llvm::DwarfCompileUnit::finishSubprogramDefinition(), llvm::DwarfCompileUnit::getOrCreateCommonBlock(), getOrCreateContextDIE(), llvm::DwarfCompileUnit::getOrCreateGlobalVariableDIE(), getOrCreateModule(), getOrCreateNameSpace(), getOrCreateStaticMemberDIE(), getOrCreateSubprogramDIE(), getOrCreateTypeDIE(), and hasContent(). Returns a fresh newly allocated DIELoc. Definition at line 121 of file DwarfUnit.h. References addBlock(), addBlockByrefAddress(), addConstantFPValue(), addConstantValue(), addDIEEntry(), addDIETypeSignature(), addFlag(), addLabel(), addLabelDelta(), addLinkageName(), addOpAddress(), addSectionOffset(), addSInt(), addSourceLine(), addString(), addTemplateParams(), addThrownTypes(), addType(), addUInt(), applySubprogramAttributes(), llvm::AMDGPU::HSAMD::Kernel::Key::Args, constructContainingTypeDIEs(), constructSubprogramArguments(), createAndAddDIE(), createTypeDIE(), DIEValueAllocator, File, G, getOrCreateContextDIE(), getOrCreateModule(), getOrCreateNameSpace(), getOrCreateSubprogramDIE(), getOrCreateTypeDIE(), llvm::MipsISD::Hi, insertDIE(), llvm::Integer, llvm::LinkageName, llvm::MipsISD::Lo, N, llvm::Tag, and Unsigned. Definition at line 91 of file DwarfUnit.h. Definition at line 87 of file DwarfUnit.h. Compute the size of a header for this unit, not including the initial length field. Reimplemented in llvm::DwarfTypeUnit, and llvm::DwarfCompileUnit. Definition at line 264 of file DwarfUnit.h. References addLoclistsBase(), addRnglistsBase(), addSectionDelta(), addSectionLabel(), addStringOffsetsStart(), constructTypeDIE(), emitHeader(), getCU(), llvm::DwarfDebug::getDwarfVersion(), getMD5AsBytes(), getOrCreateSourceID(), getOrCreateStaticMemberDIE(), and ~DwarfUnit(). Referenced by llvm::DwarfFile::computeSizeAndOffsetsForUnit(), llvm::DwarfCompileUnit::getHeaderSize(), and llvm::DwarfTypeUnit::getHeaderSize(). Definition at line 88 of file DwarfUnit.h. Referenced by applySubprogramAttributes(), computeIndexValue(), constructSubprogramArguments(), getParentContextString(), and ~DwarfUnit(). If the File has an MD5 checksum, return it as an MD5Result allocated in the MCContext. Definition at line 292 of file DwarfUnit.cpp. References addSectionOffset(), Asm, assert(), llvm::MD5::MD5Result::Bytes, llvm::copy(), llvm::DIFile::CSK_MD5, DD, File, llvm::fromHex(), llvm::DwarfTypeUnit::getCU(), llvm::DIScope::getDirectory(), llvm::MCContext::getDwarfVersion(), llvm::DwarfDebug::getDwarfVersion(), llvm::MCDwarfDwoLineTable::getFile(), llvm::DIScope::getFilename(), llvm::DwarfCompileUnit::getOrCreateSourceID(), llvm::DIScope::getSource(), llvm::DIEUnit::getUnitDie(), llvm::None, and llvm::AsmPrinter::OutContext. Referenced by emitDebugRangesImpl(), getHeaderSize(), and llvm::DwarfCompileUnit::getOrCreateSourceID(). Definition at line 597 of file DwarfUnit.cpp. References getDIE(), getOrCreateModule(), getOrCreateNameSpace(), getOrCreateSubprogramDIE(), getOrCreateTypeDIE(), and llvm::DIEUnit::getUnitDie(). Referenced by llvm::DwarfCompileUnit::constructAbstractSubprogramScopeDIE(), llvm::DwarfTypeUnit::createTypeDIE(), getDIELoc(), llvm::DwarfCompileUnit::getOrCreateCommonBlock(), llvm::DwarfCompileUnit::getOrCreateGlobalVariableDIE(), getOrCreateModule(), getOrCreateNameSpace(), getOrCreateStaticMemberDIE(), getOrCreateSubprogramDIE(), getOrCreateTypeDIE(), and llvm::DwarfDebug::shareAcrossDWOCUs(). Definition at line 1070 of file DwarfUnit.cpp. References llvm::DwarfTypeUnit::addGlobalName(), addString(), createAndAddDIE(), llvm::StringRef::empty(), llvm::DIModule::getConfigurationMacros(), getDIE(), llvm::DIModule::getIncludePath(), llvm::DIModule::getISysRoot(), llvm::DIModule::getName(), getOrCreateContextDIE(), and llvm::DIModule::getScope(). Referenced by llvm::DwarfCompileUnit::constructImportedEntityDIE(), getDIELoc(), and getOrCreateContextDIE(). Definition at line 1049 of file DwarfUnit.cpp. References llvm::DwarfDebug::addAccelNamespace(), addFlag(), llvm::DwarfTypeUnit::addGlobalName(), addString(), createAndAddDIE(), CUNode, DD, llvm::StringRef::empty(), getDIE(), llvm::DINamespace::getExportSymbols(), llvm::DINamespace::getName(), getOrCreateContextDIE(), llvm::DINamespace::getScope(), and Name. Look up the source ID for the given file. If none currently exists, create a new ID and insert it in the line table. Create new static data member DIE. Definition at line 1524 of file DwarfUnit.cpp. References addConstantFPValue(), addConstantValue(), addFlag(), addSourceLine(), addString(), addType(), addUInt(), assert(), createAndAddDIE(), llvm::dwarf::DW_ACCESS_private, llvm::dwarf::DW_ACCESS_protected, llvm::dwarf::DW_ACCESS_public, llvm::DIType::getAlignInBytes(), getDIE(), llvm::DIType::getName(), getOrCreateContextDIE(), llvm::DIType::getScope(), llvm::DINode::getTag(), llvm::DIE::getTag(), llvm::DIType::isPrivate(), llvm::DIType::isProtected(), llvm::DIType::isPublic(), llvm::dwarf::isType(), and resolve(). Referenced by constructTypeDIE(), getHeaderSize(), and llvm::DwarfCompileUnit::getOrCreateGlobalVariableDIE(). Definition at line 1094 of file DwarfUnit.cpp. References applySubprogramAttributes(), createAndAddDIE(), getDIE(), getOrCreateContextDIE(), llvm::DIScope::getScope(), llvm::DIE::getUnit(), llvm::DIEUnit::getUnitDie(), and resolve(). Referenced by llvm::DwarfCompileUnit::constructAbstractSubprogramScopeDIE(), llvm::DwarfCompileUnit::constructCallSiteEntryDIE(), llvm::DwarfCompileUnit::constructImportedEntityDIE(), constructTypeDIE(), getDIELoc(), getOrCreateContextDIE(), and llvm::DwarfCompileUnit::updateSubprogramScopeDIE(). Find existing DIE or create new DIE for the given type. Definition at line 653 of file DwarfUnit.cpp. References assert(), Context, llvm::DwarfTypeUnit::createTypeDIE(), DD, getBaseType(), getDIE(), llvm::DwarfDebug::getDwarfVersion(), getOrCreateContextDIE(), llvm::DIE::getTag(), and resolve(). Referenced by addType(), llvm::DwarfDebug::beginModule(), llvm::DwarfCompileUnit::constructImportedEntityDIE(), constructTypeDIE(), getDIELoc(), getOrCreateContextDIE(), and getParentContextString(). Get string containing language specific context for a global name. Walks the metadata parent chain in a language specific manner (using the compile unit language) and returns it as a string. This is done at the metadata level because DIEs may not currently have been added to the parent context and walking the DIEs looking for names is more expensive than walking the metadata. Definition at line 704 of file DwarfUnit.cpp. References addDIEEntry(), addSourceLine(), addString(), addType(), addUInt(), constructTypeDIE(), llvm::StringRef::empty(), llvm::DIBasicType::getEncoding(), getLanguage(), llvm::DIType::getName(), getOrCreateTypeDIE(), llvm::DIScope::getScope(), llvm::DIType::getSizeInBits(), llvm::DINode::getTag(), llvm::DIE::getTag(), llvm::DIType::isBigEndian(), llvm::DIType::isForwardDecl(), llvm::DIType::isLittleEndian(), llvm::make_range(), Name, llvm::None, llvm::SmallVectorTemplateBase< T >::push_back(), llvm::SmallVectorTemplateCommon< T >::rbegin(), llvm::SmallVectorTemplateCommon< T >::rend(), resolve(), Size, and llvm::Tag. Referenced by llvm::DwarfCompileUnit::addGlobalName(), llvm::DwarfCompileUnit::addGlobalNameForTypeUnit(), llvm::DwarfCompileUnit::addGlobalType(), llvm::DwarfCompileUnit::addGlobalTypeUnitType(), and hasContent(). Return true if this compile unit has something to write out. Definition at line 94 of file DwarfUnit.h. References addGlobalName(), addGlobalType(), Context, D, getDIE(), getParentContextString(), llvm::DIEUnit::getUnitDie(), llvm::DIE::hasChildren(), and Name. Insert DIE into the map. Definition at line 196 of file DwarfUnit.cpp. References DU, llvm::DwarfFile::insertDIE(), isShareableAcrossCUs(), and MDNodeToDieMap. Referenced by llvm::DwarfCompileUnit::constructImportedEntityDIE(), llvm::DwarfCompileUnit::constructLabelDIE(), createAndAddDIE(), and getDIELoc(). Check whether the DIE for this MDNode can be shared across CUs. Definition at line 175 of file DwarfUnit.cpp. References D, DD, llvm::DwarfDebug::generateTypeUnits(), and llvm::DwarfDebug::shareAcrossDWOCUs(). Referenced by getDIE(), and insertDIE(). Look in the DwarfDebug map for the MDNode that corresponds to the reference. Definition at line 313 of file DwarfUnit.h. References constructTypeDIE(), D, emitCommonHeader(), llvm::TypedDINodeRef< T >::resolve(), and updateAcceleratorTables(). Referenced by applySubprogramAttributes(), llvm::DwarfCompileUnit::applySubprogramAttributesToDefinition(), llvm::DwarfCompileUnit::constructAbstractSubprogramScopeDIE(), constructContainingTypeDIEs(), llvm::DwarfCompileUnit::constructImportedEntityDIE(), constructSubprogramArguments(), constructTypeDIE(), llvm::DwarfTypeUnit::createTypeDIE(), llvm::DwarfCompileUnit::getOrCreateGlobalVariableDIE(), getOrCreateStaticMemberDIE(), getOrCreateSubprogramDIE(), getOrCreateTypeDIE(), getParentContextString(), and hasVectorBeenPadded(). If this is a named finished type then include it in the list of types for the accelerator tables. Definition at line 680 of file DwarfUnit.cpp. References llvm::DwarfDebug::addAccelType(), llvm::DwarfTypeUnit::addGlobalType(), Context, CUNode, DD, llvm::dwarf::DW_FLAG_type_implementation, llvm::StringRef::empty(), llvm::DIType::getName(), and llvm::DIType::isForwardDecl(). Referenced by createTypeDIE(), llvm::DwarfTypeUnit::createTypeDIE(), and resolve(). Definition at line 258 of file DwarfUnit.h. Definition at line 49 of file DwarfUnit.h. Referenced by llvm::DwarfCompileUnit::addAddress(), llvm::DwarfCompileUnit::addAddrTableBase(), addBlock(), llvm::DwarfCompileUnit::addComplexAddress(), addConstantFPValue(), addConstantValue(), llvm::DwarfTypeUnit::addGlobalType(), llvm::DwarfCompileUnit::addLocationAttribute(), addLoclistsBase(), addRnglistsBase(), llvm::DwarfCompileUnit::addScopeRangeList(), addSectionLabel(), addString(), addStringOffsetsStart(), applySubprogramAttributes(), constructContainingTypeDIEs(), llvm::DwarfCompileUnit::constructLabelDIE(), constructTypeDIE(), emitCommonHeader(), llvm::DwarfCompileUnit::emitHeader(), llvm::DwarfTypeUnit::emitHeader(), getAsmPrinter(), getMD5AsBytes(), llvm::DwarfCompileUnit::getOrCreateSourceID(), llvm::DwarfCompileUnit::initStmtList(), and llvm::DwarfCompileUnit::updateSubprogramScopeDIE(). 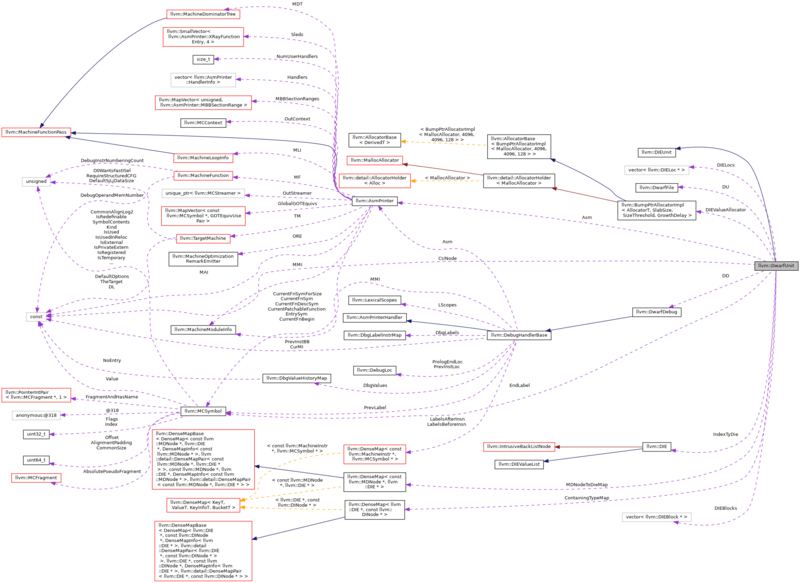 This map is used to keep track of subprogram DIEs that need DW_AT_containing_type attribute. This attribute points to a DIE that corresponds to the MDNode mapped with the subprogram DIE. Definition at line 74 of file DwarfUnit.h. Referenced by applySubprogramAttributes(), and constructContainingTypeDIEs(). MDNode for the compile unit. Definition at line 43 of file DwarfUnit.h. Referenced by llvm::DwarfCompileUnit::addLocationAttribute(), addString(), applySubprogramAttributes(), llvm::DwarfCompileUnit::constructInlinedScopeDIE(), getCUNode(), getOrCreateNameSpace(), llvm::DwarfCompileUnit::hasDwarfPubSections(), llvm::DwarfCompileUnit::initStmtList(), updateAcceleratorTables(), and llvm::DwarfCompileUnit::updateSubprogramScopeDIE(). Definition at line 55 of file DwarfUnit.h. Referenced by llvm::DwarfCompileUnit::addAddrTableBase(), addBlock(), addConstantValue(), addFlag(), llvm::DwarfCompileUnit::addLabelAddress(), addLinkageName(), llvm::DwarfCompileUnit::addLocalLabelAddress(), llvm::DwarfCompileUnit::addLocationAttribute(), llvm::DwarfCompileUnit::addLocationList(), addLoclistsBase(), addOpAddress(), llvm::DwarfCompileUnit::addRange(), addRnglistsBase(), llvm::DwarfCompileUnit::addScopeRangeList(), addSectionDelta(), addSectionLabel(), addSectionOffset(), addString(), applySubprogramAttributes(), llvm::DwarfCompileUnit::applySubprogramAttributesToDefinition(), applySubprogramDefinitionAttributes(), llvm::DwarfCompileUnit::attachRangesOrLowHighPC(), llvm::DwarfCompileUnit::constructAbstractSubprogramScopeDIE(), constructContainingTypeDIEs(), llvm::DwarfCompileUnit::constructInlinedScopeDIE(), llvm::DwarfCompileUnit::constructLabelDIE(), llvm::DwarfCompileUnit::constructLexicalScopeDIE(), llvm::DwarfCompileUnit::constructScopeDIE(), constructTypeDIE(), createTypeDIE(), emitCommonHeader(), llvm::DwarfCompileUnit::emitHeader(), llvm::DwarfTypeUnit::emitHeader(), llvm::DwarfCompileUnit::getHeaderSize(), getMD5AsBytes(), llvm::DwarfCompileUnit::getOrCreateGlobalVariableDIE(), getOrCreateNameSpace(), getOrCreateTypeDIE(), llvm::DwarfCompileUnit::hasDwarfPubSections(), hasVectorBeenPadded(), llvm::DwarfCompileUnit::includeMinimalInlineScopes(), llvm::DwarfCompileUnit::initStmtList(), isShareableAcrossCUs(), updateAcceleratorTables(), llvm::DwarfCompileUnit::updateSubprogramScopeDIE(), and ~DwarfUnit(). A list of all the DIEBlocks in use. Definition at line 66 of file DwarfUnit.h. Referenced by addBlock(), and ~DwarfUnit(). A list of all the DIELocs in use. Definition at line 69 of file DwarfUnit.h. Definition at line 46 of file DwarfUnit.h. Referenced by llvm::DwarfCompileUnit::addAddress(), llvm::DwarfCompileUnit::addAddressExpr(), llvm::DwarfCompileUnit::addBaseTypeRef(), addBlock(), llvm::DwarfCompileUnit::addComplexAddress(), addConstantFPValue(), addConstantValue(), addDIEEntry(), addDIETypeSignature(), llvm::DwarfCompileUnit::addExpr(), addFlag(), addLabel(), llvm::DwarfCompileUnit::addLabelAddress(), addLabelDelta(), llvm::DwarfCompileUnit::addLocalLabelAddress(), llvm::DwarfCompileUnit::addLocationAttribute(), llvm::DwarfCompileUnit::addLocationList(), addSectionDelta(), addSInt(), addString(), addUInt(), llvm::DwarfCompileUnit::applyStmtList(), constructContainingTypeDIEs(), llvm::DwarfCompileUnit::constructImportedEntityDIE(), llvm::DwarfCompileUnit::constructInlinedScopeDIE(), llvm::DwarfCompileUnit::constructLabelDIE(), llvm::DwarfCompileUnit::constructLexicalScopeDIE(), llvm::DwarfCompileUnit::constructSubprogramScopeDIE(), constructTypeDIE(), createAndAddDIE(), llvm::DwarfCompileUnit::createBaseTypeDIEs(), getDIELoc(), and llvm::DwarfCompileUnit::updateSubprogramScopeDIE(). Definition at line 56 of file DwarfUnit.h. Referenced by addLoclistsBase(), addRnglistsBase(), llvm::DwarfCompileUnit::addScopeRangeList(), addString(), addStringOffsetsStart(), applySubprogramDefinitionAttributes(), llvm::DwarfCompileUnit::createScopeChildrenDIE(), getDIE(), and insertDIE(). Emitted at the end of the CU and used to compute the CU Length field. Definition at line 52 of file DwarfUnit.h. Referenced by emitCommonHeader(), and getEndLabel(). An anonymous type for index type. Owned by DIEUnit. Definition at line 59 of file DwarfUnit.h. Tracks the mapping of unit level debug information variables to debug information entries. Definition at line 63 of file DwarfUnit.h.